My knitting ambitions are always quite grand. Usually I get a jolt of reality BEFORE embarking on big huge deadline-dependent projects, but other times I start them, I get bored, and they languish. 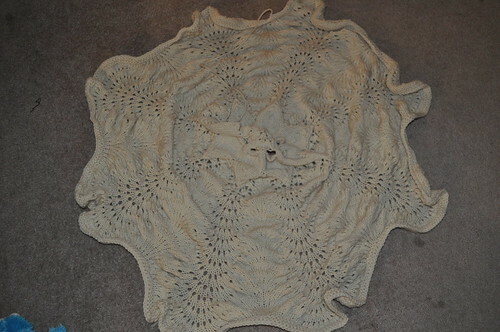 (Take, for example, the blanket I started knitting for a friend's baby. 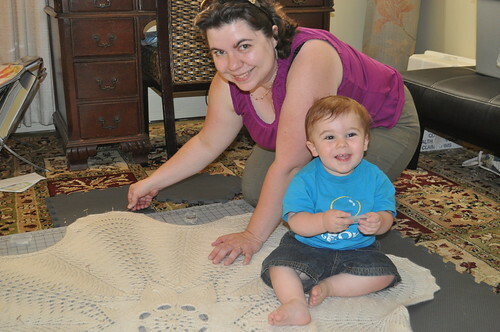 Said baby is now three, her little brother will be one next week, and the blanket is still only about two-thirds done. Maybe I'll finish it someday for SOME baby.) But this year, I got ambitious, I started a Big Project, and I actually Followed Through. With time to spare, even! I had been wanting to knit this for a long time, and decided that it would make a good wedding gift for my dear friends Brian and Larry. Even as I cast on, I thought there was no way I would ever actually finish it in the six months I'd allocated for the project. 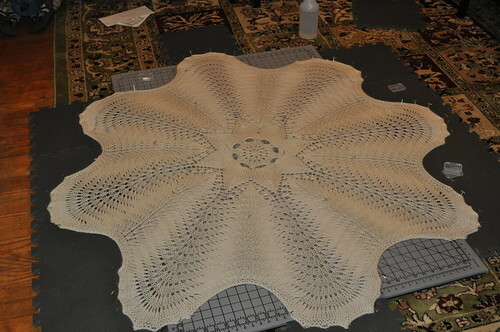 I motored through the center medallion pretty quickly, but then the feather-and-fan portion got a little tedious and I put the project down for a couple of months. But eventually I pulled it back out and realized that it was a good TV-watching project since there's so much straight knitting. Towards the end, the rounds got very VERY long, but still, I cast off with more than a month to spare before the wedding date! It did, of course, need a good blocking. Ian had to be otherwise occupied during the pinning, but I let him hang out with me the following day while I was UNpinning. He was in charge of holding the empty plastic pin container. He became quite adept at opening and closing it while I pulled out the pins and put them all in the other empty container. 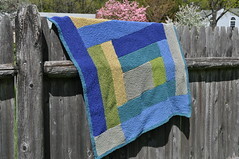 I used about two skeins, I think, of Cascade Eco Wool. I'm not entirely certain -- the ginormous skeins were too large for my ballwinder, so I had to split them. Three skeins of yarn became six cakes of varying sizes. I used about four of them, but I'm honestly not sure if I used all the big cakes, or all the small ones, or what. But it was, to be sure, somewhere between two and three skeins of yarn. I really liked the yarn -- it's a tad bit on the scratchy side, but it just feels, well, nice and warm and wooly and authentic, somehow. It softened up quite a bit after its soak in Eucalan, too. I followed the pattern as written until the bindoff: rather than doing the fussy scalloped thing the pattern called for, I just did a garter stitch bindoff. Knit to the end of the chart, and then purl a round, knit a round, purl a round, and bind off knitwise. Maybe this is what he's waiting for? No baby yet -- he's now officially two days late. We know, of course, that most first babies arrive late, but still, that's not stopping us from trying to think of things he might be waiting for. Jim put batteries in the crib mobile, we installed the carseat base in my car (Jim's had the seat/base in his car for some time now, since that's the one we'll be taking to the hospital), and I finished the baby blankie, with hours to spare before his due date arrived. I didn't really follow the pattern per se -- I kind of read through it and then just made it up as I went along. 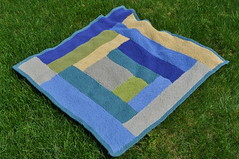 The technique lends itself very well to this: you just knit squares/rectangles, bind them off, and then pick up stitches for another square. Easy peasy. Considering this is all garter stitch, I'm kind of impressed I finished it. It got pretty tedious towards the end. I think having the different colors to look forward to helped, though. I use this yarn a lot, and I continue to like it. Cotton isn't really my favorite fiber to knit with -- it hurts my wrists -- but I like the finished product. After knitting, in lieu of a real "blocking" I just ran this through the washer and dryer, and it softened up and will be, I think, quite cozy. Now I'm kind of at a loss for what to knit! I did start Lavalette recently, but it's not what I feel like working on right now. Maybe it's time to cast on for the hippo from Itty Bitty Toys. 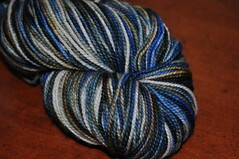 I did cast on for a Multnomah shawl, using this lovely Madelinetosh Tosh Sock (colorway "shoreline"). I don't know whether or not I'll actually want to knit while in labor (or, indeed, in the hospital at all), but I wanted to be prepared in case I do feel like it! 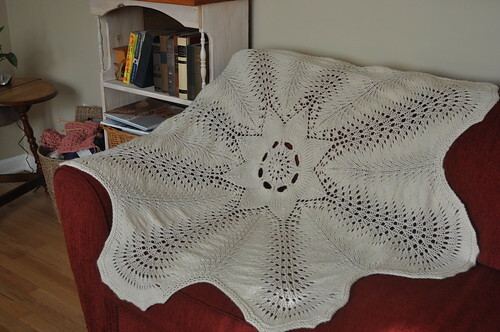 A simple shawl in a really lovely yarn seemed like the ticket. I cast on for the project during a non-stress test yesterday.